Thanks for your patience this weekend while I was able to go out and enjoy a rare 80-plus-degree weekend here in the Seattle area. It was beautiful out, and I wasn't about to pass that up! I also don't have much to say about beating the Rangers 3 out of 4 -- I mean, really, what else can you say about beating the crap out of the worst team in baseball? Hooray for bad baseball! I think Jeff Sullivan over at Lookout Landing said it best: This is what it must have been like to play the Mariners the last three years. Meanwhile, Geoff Baker has picked up on the wild card angle this morning, and he's got some interesting thoughts about whether the M's are contenders. It was widely assumed early in the year that the West was the weakest of the American League divisions, with speculation that a record at or near .500 might be good enough to win its playoff berth. 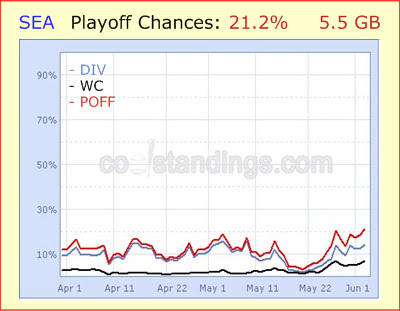 The other reason Seattle is so close in the wild-card, despite being only three games above .500, is the increased over-all "parity" or "mediocrity" or whatever you want to call it, in the AL. Look no further than the AL East to figure out why. The Boston Red Sox are the only team with a winning record in baseball's Cadillac division while everyone else stumbles around. You can blame a lack of pitching in the division for that one. Perhaps we truly are seeing a shift in the balance of power. I've believed for a while that the AL Central had become the best division in baseball. But it's also now possible that the AL East has become the worst division of the three in the AL. If that's the case -- and you can argue that the AL West's superior pitching does make it the better division of the two -- then teams previously dismissed outright as wild-card candidates have to be reconsidered. Hello, Mariners. The Tigers currently lead, and I'm not sure any of us think the M's are as good as Detroit, but I don't really see anyone else on that list that I would outright say is a better team than the M's. And that's encouraging in and of itself, if for nothing else than to give us something to look forward to this summer.